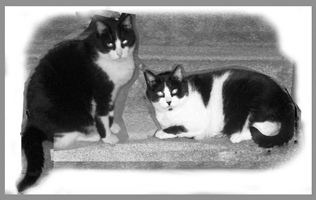 This mock pose is a crude representation of Boots and Tipper on steps. It was created by combining several different reference photographs. 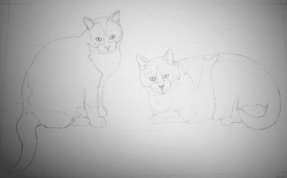 Although rather difficult to see clearly, this is the basic sketch outline for the cat portrait. I've started working on Boots' facial details. The eyes are much clearer than the original photograph. 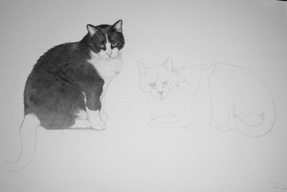 Black fur needs lots of layering of graphite. I mainly use a soft 9B pencil for the darkest areas. Boots portrait is almost complete. There are many subtle highlights to his shinny black coat. The details of Tipper's face are slowly emerging. To avoid dirtying the drawing, I work from left to right and place clean sheets of paper over areas that are dark. 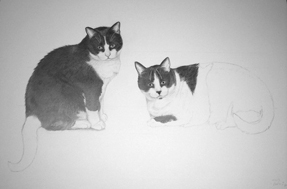 Once these tuxedo cats are complete, I will spray the graphite with a fixative to prevent smudging. 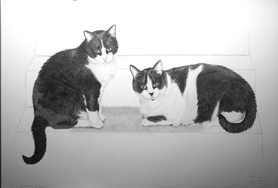 Then I will start to draw the stairs and these two felines will no longer look as if they are floating on the paper. 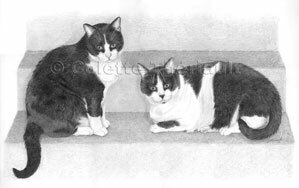 A few more finishing touches to the cats are needed. You can start to see the steps as I am beginning to shade them in. 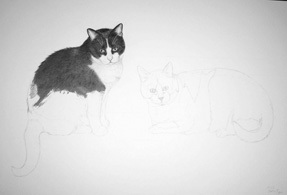 After filling in the steps with shading I define the shadows around both cats. .Boots' and Tipper's portrait is now complete.